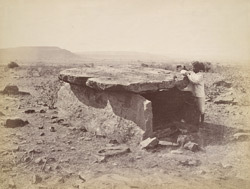 Photograph of the dolmen near the Meguti Temple at Aihole, taken by Henry Cousens in the 1880s. Aihole was one of the capitals and an important commercial centre of the Early Western Chalukya, a powerful dynasty which ruled the Deccan from the 6th century. Together with the two other capitals of Badami and Pattadakal, the site has preserved many Hindu and Jain temples which belong to a period that goes from the 6th to the 12th centuries, belonging to the Early and Late Chalukya periods and to the Rashtrakuta era. There are around 20 dolmens on the top of the hill that dominates the village of Aihole scattered around the Meguti Temple. They consist of three upright slabs forming three sides of a square with a large flat slab laid over to form a roof. Originally there was another upright slab closing up the front which sometimes had a circular hole. They date to the pre-historic period and would have been used either as tombs or as commemorative monuments.